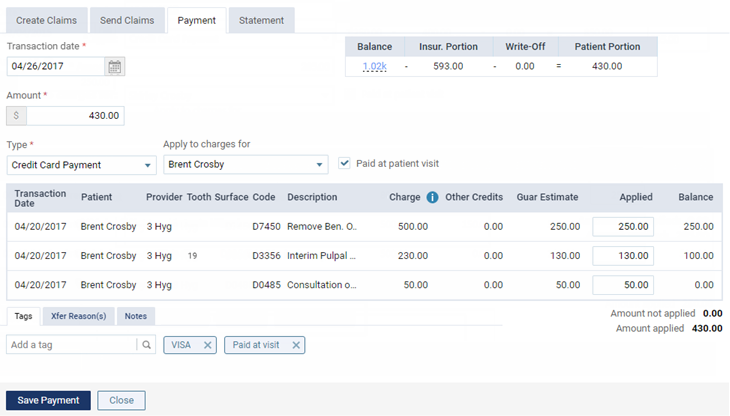 You can enter a payment, generate a walkout statement, and create claims at the same time for a patient when that patient is ready to check out after a visit. On a patient's Ledger page, click (or tap) Patient Walkout. The Patient Walkout dialog box appears. Select the check boxes of any completed procedures posted to the patient's ledger that are not attached to claims. Procedures are grouped by Service Date, so you can create separate claims for each unique date of service. Select the check boxes of the claims that you want to send. When Dentrix Ascend asks you to swipe the patient's HICAPS card, swipe the card through the HICAPS card reader. Type the Amount of the payment. The other payment options become available. Set up the payment details as needed. Click (or tap) Save Payment . Repeat steps a - d for any other payments that you need to post. Guarantor View - Select this option to include transactions for the current patient, all patients who have the same guarantor as the current patient, and the guarantor (if not the current patient). 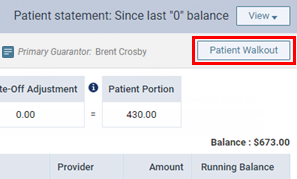 Patient View - Select this option to include transactions for the current patient. This option is not available if the patient is the guarantor for only himself or herself (the Guarantor View option will be used). Statement Message - Type a message that you want to have appear at the bottom of the walkout. This message will be saved for the current patient (and appear on this patient's individual statements and walkouts from now on) when you click (or tap) Print Walkout Statement. In addition to this patient-specific message, a general message may also appear below at the bottom of the walkout (if a default message exists for batch statements). Include credit card payment options - Select this check box to have credit card payment options appear on the walkout. Include due date as - Select this check box to have the specified date entered as the due date on the walkout. Note: You can choose a date that is 1 to 180 days in the future. However, industry consultants recommend that the due date be 30 days, which is the default. To record a summary of the statement in the patient's connections history and save a copy of the statement in the patient's Document Manager, set the Add to Patient Connection switch to Yes. To not record the statement as a patient connection or save a copy of the statement, set the switch to No. With this swtich set to Yes, the patient's "last billed date" is updated, which affects which statements get generated if you generate a batch of statements in the future using the Only generate statement if not billed since option. 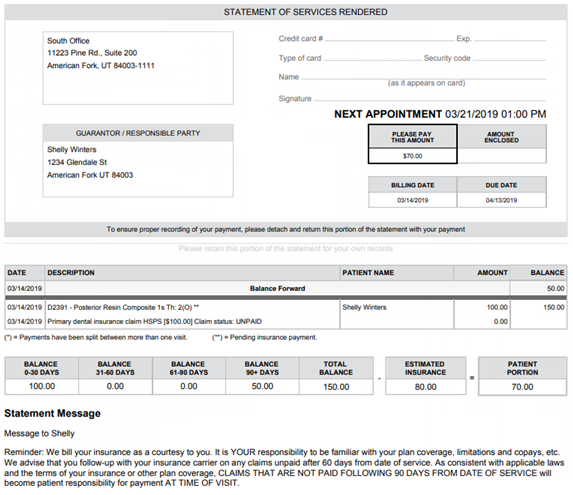 With this swtich set to Yes, if the Guarantor View option is selected, a patient connection is added to, a copy of the statement is copied to, and the "last billed date" is updated for not only the current patient but the patient's guarantor (if not the same) and all patients who have that guarantor. Click (or tap) Print Walkout Statement. A .pdf version of the walkout appears. Note: A balance forward amount will appear on the walkout for the account's balance up to today's date.